The Freedom Historical Society invites its members to come to Freedom Town Hall on Elm Street in Freedom on Wednesday, October 19th for the annual meeting and to enjoy a pot luck dinner featuring fresh ham from Cragged Mountain Farm. The dinner begins at 5:30 pm, and at 6:30 pm, we will draw the winning ticket for the beautiful Freedom quilt — don’t miss it! The lucky winner will be announced and notified on Thursday, October 20th, if not present. At 7 pm, following the potluck dinner and annual meeting for members, FHS is pleased to present the last program of the season: “Poor Houses and Town Farms: The Hard Row for Paupers” presented by the venerable Steve Taylor. Steve Taylor is an independent scholar, farmer, journalist, and longtime public official. With his sons, Taylor operates a dairy, maple syrup, and cheese making enterprise in Meriden Village. He has been a newspaper reporter and editor, and served for 25 years as New Hampshire’s commissioner of agriculture. Taylor was the founding executive director of the NH Humanities Council and is a lifelong student of the state’s rural culture. From its earliest settlements New Hampshire has struggled with issues surrounding the treatment of its poor. The early Northeastern colonies followed the lead of England’s 1601 Poor Law, which imposed compulsory taxes for maintenance of the poor but made no distinction between the “vagrant, vicious poor” and the helpless, and honest poor. This confusion persisted for generations and led directly to establishment in most of the state’s towns of alms houses and poor farms and later, county institutions which would collectively come to form a dark chapter in New Hampshire history. Steve Taylor will examine how paupers were treated in these facilities and how reformers eventually succeeded in closing them down. Following the program presentation at 7 pm, which is open and free to the public, refreshments will be served. For additional information, please call 603-539-5799. The Freedom Historical Society welcomes Dr. Andrew Smith to Freedom Town Hall for a presentation which examines New Hampshire’s role in the presidential nomination process, the impact of front loading, and the potential impact of the new Democratic primary schedule. Dr. Smith is the director of the University of New Hampshire Survey Center, a nonpartisan, academic public opinion research center for governments, nonprofits, and faculty researchers. Dr. Smith is also an associate professor in the UNH Department of Political Science. His research has focused on survey methodology, elections, and public policy. The Survey Center is nationally known for its election polling, and has consistently conducted the most accurate polling in New Hampshire elections. In recent years, the Survey Center has conducted polls for CNN, Fox News, WCVB in Boston, WMUR in Manchester, KYW in Philadelphia, USA Today, the Boston Globe, and the Philadelphia Inquirer. Please join Freedom Society members and friends at 7PM on Wednesday, September 21 at Freedom Town Hall. The public is welcome, and the program is free. Refreshments will be served following Dr. Smith’s presentation. Virgil “Chick” Valicenti (1914-1989) was from Weymouth, MA and established “The Pinnacle” in Freedom NH as a tourist destination on the top of Scarboro Road. In the winter there were two rope tows to get skiers up the hill. The resort only lasted a few years in the mid to late 1940’s to the early 1950’s. Click here to view his brochure. The Freedom Historical Society (FHS) has received a grant from the New Hampshire Humanities Council for its August 17 program, and is pleased to host speaker Robert B. Perreault. Mr Perreault will present this engaging program about vintage post cards and their importance in local history. Post cards have many a story to tell about the built landscape, disastrous events such as fires or floods, daily folk customs, and the identity of place. During the golden age of the post card, before telephones, personal messages could contain anything from the mundane, “Having a fine time, wish you were here…”, to more profound reflections on family life or colorful portraits of towns and cities from the perspective of newly-landed immigrants. Vintage post cards of Manchester offer a lively, nostalgic adventure through a major industrial center, home to people from around the world. 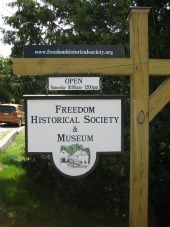 In addition, a new FHS Museum exhibit will display fascinating reflections of Freedom from a bygone era. A FHS volunteer has been working all summer on this new exhibit of over 30 vintage postcard images of Freedom. The public is welcome to join FHS members on Wednesday, August 17, at 7PM at Freedom Town Hall on Elm Street to hear this fascinating presentation and to see the FHS exhibit. The program is free, and refreshments will be served following it. For additional information, please call 603-301-1073. Learn about the Freedom connection to the first Bell telephone. Talk over two 1914 vintage telephones! Please join us on Saturday, August 6 at 11 am for a reception to present the new exhibit on the history of the telephone in America and Freedom. The exhibit was graciously designed, built and donated courtesy of the Williams family descendants. The exhibit is free and open to the public from 10 am to 12 noon. Refreshments will be served for the reception at 11. For more information, please call 603-539-5799. Learn why this doll house was designed by a professional architect and built with exacting detail- it is a personal story. All are invited to attend an open house at the Freedom Historical Society & Museum on Saturday, July 23 from 10 to 12 to view the Thomson Doll House. The newly-refurbished miniature is a 1950’s replica of the Thomson family home with exacting detail of all rooms and furnishings. Even wall paintings were replicated in miniature! Afterward you can visit the home as it appears today at the end of Elm Street and Village Rd where Maynard & Laura Thomson will give you a tour and serve light refreshments from 11 to 1. Mark your calendar — this is three-dimensional Freedom story you won’t want to miss! FHS has received a grant from the New Hampshire Humanities Council for its July 20 program and is pleased to host Marcia Schmidt Blaine who will present the program for the evening: “A Woman That Keeps Good Orders: Women, Tavern Keeping, and Public Approval.” Marcia Schmidt Blaine is a historian of New Hampshire and New England history and Chair of the Department of History, Philosophy and Social Studies at Plymouth State University. While her academic work focuses on the development of American identity, eighteenth-century New Hampshire women, and Anglo captives of the Abenaki, Blaine also explores various aspects of White Mountains history through her work with the Museum of the White Mountains in Plymouth. The presentation explores why, with Government regulations, licensing, handling drunks, controlling the flow of information, the Colonial-era government would have allowed women to run a tavern. When her husband died in 1736, Ann Jose Harvey became the owner of a prominent Portsmouth tavern and sole guardian of seven small children. For at least twenty years, Harvey ran the increasingly prosperous establishment. Using documents related to Harvey’s venue, Marcia Schmidt Blaine explores the world of female tavern keepers. A tavern was potentially the most disruptive spot in town. Why would a woman want to keep one? The public is welcome to join FHS members on Wednesday, July 20 at 7pm at Freedom Town Hall on Elm Street to hear this insightful lecture. The presentation is free, and refreshments will be served following the program. The 2017 Calendar is Here! eautifully conveys the essence of our lovely Village. These paintings tell a story of the town through…click here for more information. Freedom Historical Society (FHS) is selling raffle tickets for a unique one-of-a-kind queen size quilt to benefit FHS. Proceeds from the raffle will be used to improve access to a special display at the Museum…click here for more information. 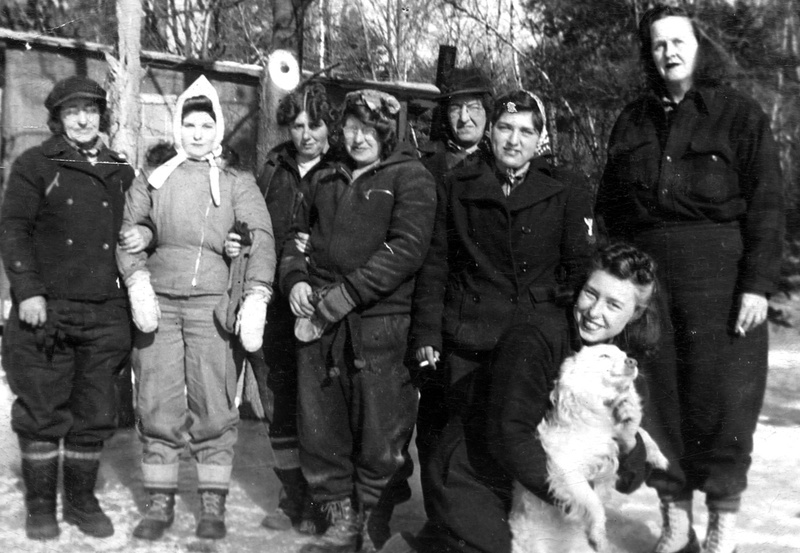 The crew of the women’s sawmill at Turkey Pond, January 14, 1943. Left to right: Mary Plourde, Barbara Webber, Violet Story, Carmilla Wilson, Lucy DeGreenia, Ruth DeRoche, Daisy Perkins, Laura Willey, and Chimney the dog. Credit: Courtesy of John Willey. Join members of the Freedom Historical Society (FHS) and Freedom Community Club (FCC) at Camp Calumet on Ossipee Lake Rd in Freedom on June 15th for a wonderful dinner ($16/pp) at 6pm followed by this program (free) at 7pm presented by Sarah Shea Smith. Attend one or both! Sarah Shea Smith is Extension professor and specialist, Forest Industry, at the University of New Hampshire Cooperative Extension, a post she’s held since 1989. Mrs. Smith has worked as a hardwood lumber inspector, a teacher, and a door-and-trim carpenter. She holds a Bachelor of Science degree in forestry and a Master’s in occupational and adult education from the University of New Hampshire. She is the author of a book entitled, “They Sawed Up a Storm”, which is about an extraordinary group of women who operated a sawmill during World War II in New Hampshire. The 1938 hurricane devastated New England when more than 600 people died and property loss was equivalent to $5.5 billion in today’s dollars. Forest damage was extensive, with nearly a third of New England’s forests destroyed by the storm. In total, the hurricane blew down an estimated 2.6 billion board-feet of timber. Mrs. Smith’s presentation highlights a group of New Hampshire women who, in 1942, operated one of two sawmills on the shores of Turkey Pond, Concord. The sawmill was built by the U.S. Forest Service to saw up what remained of the logs stored in the water from the 1938 hurricane. The public is welcome to join the Freedom Community Club (FCC) members for a wonderful dinner ($16/pp) at Camp Calumet on June 15th at 6PM. The menu includes gluten free entrées of braised short ribs or chicken cacciatore ; or wild mushroom ravioli; as well as garden vegetables, salad, roasted red potatoes, rolls and berry short cake. Non-FCC members should call 603-539-5799 for dinner reservations by June 10th. Checks for the dinner must be received by June 10th and should be mailed to Freedom Historical Society (FHS), PO Box 548, Freedom, NH 03836. The FHS program, which is FREE, will start at 7PM, following the dinner. The public is invited to join one event or both. The Allard House & Works Barn Museum will open for a 25th season on Saturday, May 28, 2016 from 10-12. We will be open every Saturday from 10-12 through Labor Day. We have added Wednesdays, 10-12 to the schedule of open hours this year and, as always, the Museum can be made available by appointment. We have two new exhibits: the newly refurbished Thomson home replica doll house and an interactive presentation of Freedom’s connection to the development of the telephone and the history of it’s long awaited arrival here. Plus, our Resource Room has undergone some reorganization to better facilitate visitor research. It’s a work in progress but it’s come a long way! Please, come visit. You’ll be glad you did. Please join the Freedom Historical Society on May 18 when Gloria (Boucher) Aspinall of Madison, NH, presents her program, “Old Time Stories from the Valley.” Ms. Aspinall dynamically regales her audiences with historic stories of people, places, and events of the Mount Washington Valley. Historic events related include stories of logging camps, historic hotels, and local characters. She brings props to share, such as carvings which were carved in her grandfather’s portable logging camp on the Kancamaugas Highway, photos, tools used to make hammocks, fish nets, small stools with caning made in the logging camp, and many other artifacts. Currently serving as one of the White Mountain National Forest’s historical volunteer interpreters at the Russell-Colbath Historic House in Passaconaway, NH, Ms. Aspinall is often praised by visitors who have enjoyed her presentation as well as her enthusiastic “presence”. She is known for skillfully tailoring her informational programs to different cultures, ages, and interests. Please join us for this unique presentation on Wednesday, May 18 at 7PM at Freedom’s Town Hall located on Elm Street. There is no charge for the program, and the public is welcome. Refreshments will be provided. For additional information, please call 603-301-1073. Artists take note! Friday, May 13, is the deadline for submitting your art for the 2017 “Paintings of Freedom” calendar. May 1 begins the countdown to the seasonal opening of the Allard House & Works Barn Museum on May 28. There’s a lot to do to make that happen – building preparation, some exhibit reorganization, update some signage, and much more. We have some exciting plans for the season and will update you soon. Read below about the work the Board has been doing over the winter months! Since January, Board members have logged some 200 hours in the Museum Resource Room (our work and research area) working to sort through myriad boxes and files of paper and objects to better organize our resources. We have also added and/or updated our collection database in order to prepare numerous items for storage. The analogy we’ve used is “sorting like with like” so that all information we have on a particular topic is gathered together in one place. This process has been ongoing for years, thanks to previous Board members, but this has been a big step forward in cataloguing and preservation. The collection holds Freedom’s rich history in many different documents such as letters, diaries, photos, maps, posters, deeds, business ledgers, records of organizations like the Grange and Freedom Club of Boston, family biographies, as well as past research. The Freedom Historical Society has announced its 2016 schedule of educational programs. The first program, “Old Time Stories from the Valley” by Gloria Aspinall, Madison, is scheduled for May 18 at 7 pm at the Town Hall on Elm Street. Click here, or on the Programs tab above, to see the full schedule!